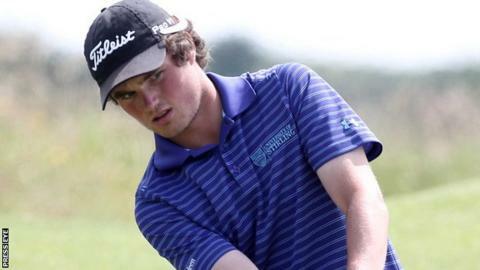 Ardglass golfer Cormac Sharvin made the cut at the Perth International in his first European Tour event after a nervy three-over-par 75 on Friday. Four straight bogeys at the start of his back nine put him on the projected cut mark of level par but a closing birdie secured his weekend spot. Sharvin's one-under total left him 10 behind leaders Peter Uihlein and Brett Rumford. Belfast man Michael Hoey missed the cut on seven over after a 74. Five-times European Tour winner Hoey's opening 77 left him needing to hit in the mid 60s to have any chance of surviving into the weekend but his round started badly with a double bogey at the 10th. And while he birdied the 11th and the first to move back to his overnight position of five over, he dropped two more shots at the par-five third. Sharvin, who helped Great Britain & Ireland win last year's Walker Cup, was given an invite to play in the European Tour event in Australia. He produced an impressive seven-birdie 68 on Thursday but found the going tougher on Friday. After starting at the 10th, Sharvin opened up with successive bogeys but appeared back in control as birdies on 14 and 18 brought him to the turn in level-par 36. However, four successive dropped shots from the first left the 23-year-old in danger of missing the cut before his steadying closing birdie. Sharvin is likely to play most of his golf on the second-tier European Challenge Tour this season although he will hope to earn a number of invites to main tour events. Wicklow man Paul Dunne missed the cut by one shot after a 72 left him on one over, which was one stroke too many.